These healthy oatmeal cookies use no sugar, flour or butter. They are virtually guilt free, and have organic bananas, apple sauce and mini chocolate chips that make them extra special for kids! The best this is that these healthy oatmeal cookies are FANTASTIC for dieters and those living healthy lifestyles because they REALLY fill you up after just one or two cookies --- unless it just was the Skinny Fiber making me feel full hours after I took it :) You'll have to try them and let me know if these yummy oatmeal cookies make you feel full, too! 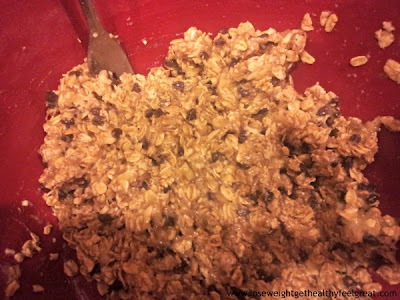 Save & Share this healthy oatmeal cookie recipe! Click the SHARE button above to save this recipe to your photos on Facebook, Twitter, Pinterest or email to yourself. 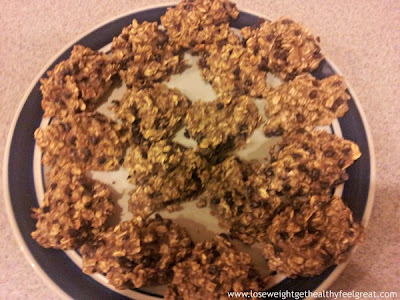 Don't forget to comment and let me know whether you liked this healthy oatmeal cookie recipe or not! I think one acquires the taste for them after the first one sets into your palate. Our little plate of cookies disappeared fast, so the kids liked it. The bananas and applesauce moisten the oatmeal cookie dough! Make sure to follow the recipe exactly even if using a non-stick tray. Our first cookie felt kind of strange to us. 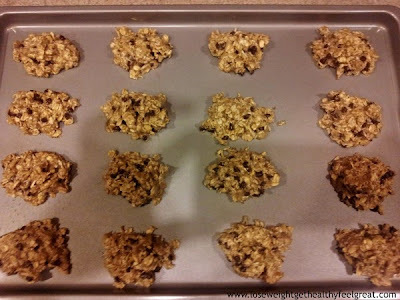 These healthy oatmeal cookies do have a different texture and taste kind of like a mini health bar, but the flavor they leave in your mouth is incredible and they actually make you feel full quicker than other cookies. * I used all organic products for this recipe! * You can use carob chips or cacao chips instead of semi-sweet chocolate chips. Preheat oven to 350 degrees. Mix all ingredients together in a medium bowl. Form into balls and place onto greased cookie sheet (or line with parchment paper for easy cleanup). With the back of a spoon, gently flatten cookie balls. Bake 15-20 minutes. Yes, carob chips are good, too :) TY. i love these cookies! I added dried cranberries, raisins & apricots delish ! I made these cookies. I used strawberry apple sauce for 1 batch. It was yummy!! Awwww, thanks so much for stopping back and letting me know :) I'm so glad you enjoyed them. BTW, Strawberry applesauce sounds good. I'll have to try with it next time. Happy New Year, Dianna!